Amid thunderous applause and joyous cheers, Pastor Frederick Price Jr. and First Lady Angel Price entered the sanctuary of the world renowned Faithdome on July 1, holding hands and smiling as the “Zamunda” theme from the “Coming to America” movie played in the background. 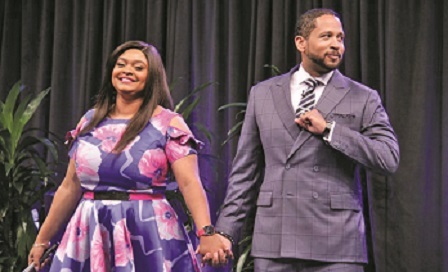 The day marked Price Jr.’s return, after a year’s absence, as the lead pastor of Crenshaw Christian Center (CCC), an international ministry boasting thousands of members, multiple schools, the massive Faithdome sanctuary and CCC New York. The prolonged standing ovation illustrated the overpowering love and affection the CCC congregation holds for Price Jr., who resumes the helm of the church founded by his parents, Apostle Frederick and Dr. Betty Price, in 1973. Prior to the entrance by the pastor and first lady, Angela Price Evans said, “We have so much to be grateful for today. I want to thank those who were a blessing to our ministry last year,” as she acknowledged several ministers that delivered sermons during the past year. In addition to her parents, Apostle Frederick and Dr. Betty, and sister, Cheryl, Evans recognized a long list of guest preachers including Pastor Michael and Dr. Deloris “DeeDee” Freeman of Spirit of Faith Christian Center in Temple Hills, Maryland; Pastor Creflo and Dr. Tammi Dollar of World Changers Church in College Park, Georgia; Apostle Beverly “Bam” Crawford of Bible Enrichment Fellowship International Church in Inglewood as well as the CCC pastoral staff. Evans also announced that her nephew, NBA player Allen Crabbe, made a significant financial donation to ensure that the Frederick Price Schools continue operating in South Los Angeles. Price Jr. also expressed gratitude to family, friend and the CCC congregation for their prayers and support during his absence. “I really want to say thank you to those who’ve stood with me and stood by me, those who have interceded, those who have stood in the gap. You didn’t know much. You just knew that I was away and I appreciate you not needing to know all of the details,” he noted. Citing several scriptures, he quoted from James 4:6, I Peter 5:5, 2 Corinthians 12:9-10 and Hebrews 4:16 to outline how the grace of God empowers believers to survive any trials they may face. Following the close of the worship service, members departed sharing feelings of refreshment and optimism about the future under Price Jr.’s leadership. “We are all so excited about what God is doing in our midst. We believe that as Pastor Price, Jr., continues the heavenly mandate to pastor this great ministry through teaching the Word of God, that the sick and brokenhearted outside our doors will come and find healing and the poor will prosper and all will come to know how much our Lord loves us,” said Mindy Reid-Glaser.